The RAF Tornado has completed its final flight after nearly 40 years in service. The single supersonic jet flew over a disbandment ceremony for its last two squadrons at RAF Marham in Norfolk today. A pilot and navigator nicknamed 'Doorknob' and 'Bamber' steered the plane for its final flypast as members of the two squadrons watched it roar overhead. First entering service in 1980, the jets have been used in operations across the world, most recently bombarding ISIS with air-to-ground missiles pushing the terrorist group back through Syria and Iraq. Squadron leader Ian 'Doorknob' Dornan, the pilot for the Tornado's final flight, described it as an 'absolute honour and a privilege'. 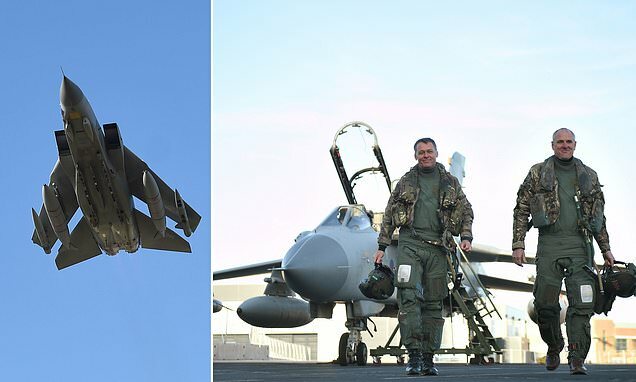 'It's really when I think about all the aircrew that have gone before me and all the engineers that have made it possible to put the jet in the air,' he said. Squadron leader Stephen 'Bamber' Beardmore, who was in the back seat as navigator, said: 'It's been a long career for me flying Tornado and it's kind of like a pair of old slippers. 'I think I just got used to it and it's been very fulfilling. 'It's a sad day to move on but I think it's time to move on. First entering service in 1979, the supersonic jets have been used in operations across the world, most recently bombarding ISIS with air-to-ground missiles pushing the terrorist group back through Syria and Iraq. The capabilities of the Tornados are now being delivered by RAF Typhoon jets.